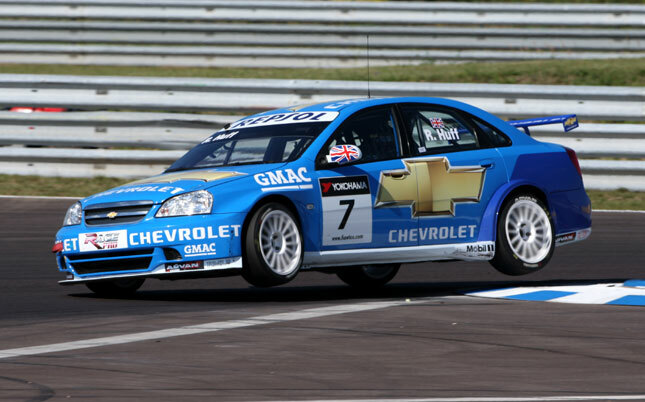 In front of a large partisan crowd, RML Chevrolet’s Rob Huff put his championship bid back on track with second and third place finishes in the two Oschersleben races in Germany, while most of the drivers ahead of him in the standings failed to score. Huff had started from pole but a jumped start by Gabriele Tarquini and then the classic first-corner mayhem marred his chances of victory. In the second race Rob drove from seventh on the grid to third, moving up to fifth in the world championship standings. Alain Menu steered clear of trouble and finished a competitive third in Race One, but got hit at the start of Race Two and had to retire. Nicola Larini fell victim to other drivers’ first-corner madness in the first race, but made a strong recovery to 11th in race 2. Rob Huff (2nd/3rd): “I had a very difficult start in race 1, as it always is here in Oschersleben. It was quite unfair as Tarquini was already ahead of me coming into the last corner, while the lights were still quite red. It is normally the pole sitter who dictates the pace, not the second man on the grid. Then for the first corner I stayed on the line and had a good braking point, but then I got hit by Nicola who had been pushed by someone else. It pushed me sideways and the passenger door flew open, but fortunately it closed itself. The incident allowed Augusto to take the lead. I then went into my race mode and passed Tarquini halfway through the race. I knew I couldn’t catch Augusto so I settled for second, which netted good points for the championship. I’m also happy for the team as we got two cars on the podium for the first time in Oschersleben. In the second race there was the more first-corner carnage, but I steered clear of that this time. I came through fourth on the first lap and knew I had to get Gené in between myself and Farfus to be safe in third, something I managed on lap 7. I immediately could close the gap to the leaders but there was just no way of passing them. Still, to take home 14 points is excellent. Alain Menu (3rd/DNF): “I didn’t expect to finish on the podium, but with what happened in Turn 1 and 2 my chances of a good finish had already increased dramatically after just a few hundred yards. Last year I started second and got hit out of the race in the same corner; this year I was lucky. From then on I just gave it all I had, passing first Monteiro and then Tarquini. I knew I wouldn’t be able to catch Rob, so the last two laps I just concentrated on bringing the car home. 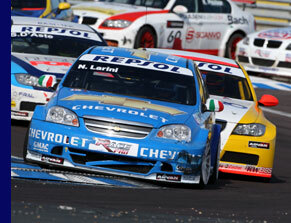 Nicola Larini (DNF/11th): “At the start of the first race I got sandwiched by the SEATs of Monteiro and Gené. Gené pushed me sideways and I slammed into Rob. Fortunately Rob could continue, but my suspension was damaged and my race was over. 1. SEAT, 216 points; 2. BMW, 192; 3. RML Chevrolet, 157; 4. Honda, 26. 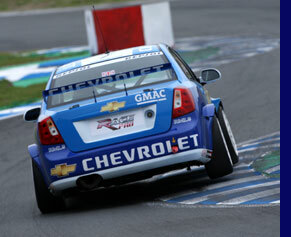 Throughout the 2008 WTCC season, Chevrolet Insight has been giving a behind-the-scenes look at the Chevrolet WTCC racing team. On Saturday and Sunday, media and fans alike can obtain the latest information and ask their questions via the web in Chevrolet's own web cast. There are regular airings during every race weekend, and then a full 15-minute review programme. Visit www.chevrolet-insight.com.